My new blog friend Candace gave me a new award! Although I don't fell like I'm deserving, I will graciously accept and pass on. Before I started my blog, I read a friend's and a niece's quite frequently. I never kept a diary when I was younger, and was really bad about keeping up with my boys' baby books. So, I wasn't sure I would have anything to say. I'm not a world traveler; heck, I've only been to a handful of states. We live in a small town, although, to be perfectly honest, the town does feel bigger than it is since we have another town "attached" to ours. But don't call us "twin towns", 'cause natives won't like that one bit! I wasn't sure I'd have anything to say, or if anyone would follow me. But I was okay with no one following me: I was doing this for me. Of course, if no one had followed me, I probably would've given up! If I can say something that brings a smile so someone's face, then it's worth it. As part of the acceptance of the award, I have to sum up my blogging philosophy, motivation, and experience in five words. My faith and my family are a big part of who I am. I love learning things about new friends and different parts of the country and the world, and, I can find humor in the weirdest ways! Being the rule-follower that I am, I hope I'm not breaking the rules in saying that if anybody else that I follow wants to participate, grab the award and send it on! It was incredibly hard to pick out a few blogs that I read; there are so many good ones out there! I could've just copied the blogs from my front page, but I'm just too lazy! So, please, feel free to accept the award! Once again, I 'd like to thank Candace at Mi Chiamo Candace for the honor! Congrats! Nice to get called out for something good! Your blog indeed has substance! I know what you mean on finding it hard to choose who to pass it on to. I found it difficult myself as I love each and every blog that I follow. The ones that I chose this time are a few of the ones that have made a difference in my continued effort at blogging. It's really nice to get to know! I'm a "rule follower" too...or at least I try to be. Another way that we are kindred spirits! I am excited to check out the blogs that you have suggested. Thanks so much! Thanks Mary! I broke the 'rules' too...I didn't tag anyone. I got so caught up in answering I left that bit out. Oops. Congratulations! 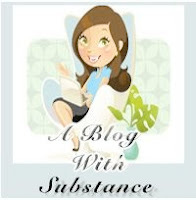 Yes, your blog has substance. I am enjoying reading your entries. Gerry, new follower. Just stopping by via Joyce and thought I'd leave a comment. Hope you don't mind. Congrats on your blogging award. With Faith, Family, Friends, Learning, and Humor at the core, you certainly sound like a person of substance and I'm sure your blog says that about you! Again, congrats! Hope you had a nice 4th and have a great week! Congrats on your blog award!! You did it to me again! But, thanks, I'm honored. Good for you. Glad to know that I am in good company. She gave it to me too. Congrats Mary and thanks for sharing. Now, I have to go and google SUBSTANCE and see if I really do have any. :) Thanks!!!! Oh Mary, you do know how to make a girl's day, eh? Thank you so much. This award means a lot to me! I know I haven't been reading your blog for a long time, but I can honestly say that I felt a connection with you from the get go. You are a bright shining light in Blog World, and I am honored to call you my friend. Keep the good posts coming! Congrats on getting the award and thank you for passing it to me. I feel deeply honored. I look forward every day to reading your blog and your sisters. It makes my day complete. I am blessed to call you friend. Yes, you've got Substance! (And thanks for thinking I have some.) Reading your blog has been like finding an old friend. Now that I see the 5 things you identify, I know why. I can relate! Congrats on the award! Nice to meet you! I am your newest follower.Hope you check my web corner. Have a wonderful and blessed Monday! !